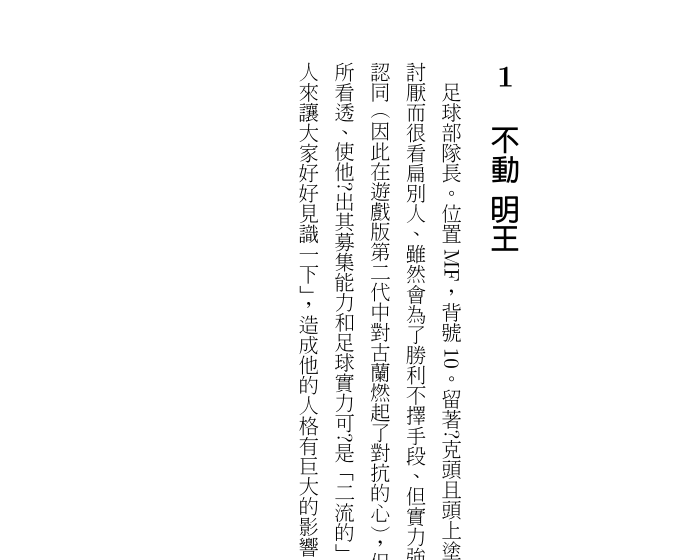 When I tried to compile my file containing Chinese text vertical style using dvipdfmx, it ended up compiling the text which was written with Chinese punctuation where the period, 。 and 、 are supposed to be in the middle like most of the Taiwanese novels I have seen to punctuation more like Japanese style which is on the top right of the last character. I looked on the website for UpTex itself and the example pdf for vertical Chinese looked appropriate when I downloaded it. Yet after using dvipdfmx on it it goes back to Japanese style punctuations. Is there a package I can use to fix the punctuation so it will look appropriate? % change the behavior of \normalfont for \section etc. [Note] When the result is still wrong (= roman letters are messed up with kanji characters), there is something wrong in the embedded fonts themselves. For example, I know that arphic-ttf fonts (bsmi00lp.ttf = ShanHeiSun-Light, bkai00mp.ttf = ZenKai-Medium; these are freely available and set as default embedding fonts by TeX Live) do not work as expected in vertical writing. By executing this, dvipdfmx does not embed any traditional Chinese fonts; as a result, the actual fonts are determined by PDF viewers -- then, whether the result is correct depends on PDF viewer. Why doesn't my Chinese character display properly?